Early identification and intervention is a critical factor in determining the future success of children experiencing developmental delays. We envision families in early intervention to be actively engaged in their child’s overall development and well-being. We help empower families to seek out community resources that support and enhance a healthy family system. We create a passion for learning through modeling, encouraging, teaching, and listening to meet individual needs. With our team, we strive to meet family needs by being flexible, non-judgmental, creative, and collaborative. As a team, we maintain unity and positive interpersonal relationships through effective and open communication that supports cohesiveness and respect. We present a positive first school experience and encourage parents to be involved in their child’s learning. We help parents recognize that they are influential in their child’s development and provide an environment for lifelong learning. 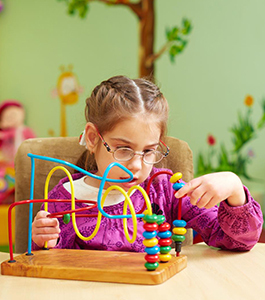 We create individualized programming for children and their families to promote developmental progress. Help Me Grow is an early intervention program for infants and toddlers (birth to three-years-old) identified with developmental delays. Participation in this program is parent-driven, free, and confidential. Parents, family members, doctors, hospital and public health nurses, WIC clinics, and childcare providers may all refer a child for an early intervention evaluation. A screening is a quick look at how a child is learning and growing. Early intervention professionals may choose to conduct a screening using simple questionnaires or by talking with you about your child’s development. If you suspect a child may have a delay in development or a condition that might result in a delay, please contact us for further evaluation. A multidisciplinary evaluation group is comprised of a qualified panel with different areas of training and experience. Together they understand the nuances of a child’s speech and language skills, physical abilities, hearing, vision, and other important areas of development. The evaluation team has expertise in working with children, even very young ones, to discover if a child has a problem or is developing within normal ranges of the five developmental areas described previously. The child is experiencing a delay meeting state criteria in one or more areas of development. All infants and toddlers are people. We value all people as individuals. Children at risk and/or with disabilities are children first.